Contrary to my assumption that eggplant originated in the Middle East or Mediterranean area, I was surprised to discover it is a native of India. It has been cultivated in southern and eastern Asia since prehistoric times and it first appeared in Chinese writings in 544. During the Middle Ages, the eggplant was introduced throughout the Middle East and Mediterranean area by Arab merchants. Today the top five eggplant producing countries are China, India, Egypt, Iran and Turkey. The eggplant is known by many names, aubergine (petite eggplant variety) in France, and Brinjal in India and Singapore. Melongene is a less common British English word. It is known as an eggplant in the Unites States and Canada. Variations on the names vary worldwide. The eggplant belongs to the large nightshade family and is related closely to the tomato and potato. It's a delicate perennial, but is treated as an annual. The color of the flower and the skin of the eggplant range from white to deep purple. It is botanically classified as a berry and you can see the soft, edible seeds inside. The seeds have a bitter edge as the nightshades including the eggplant are known for the content of alkaloids. One such alkaloid is nicotine. The eggplant is the second highest plant with a nicotine content concentration next to the tobacco, which explains the bitterness. The amount of nicotine in eggplant is negligible. Some people are allergic or have other adverse reactions to alkaloid in the fruit and vegetables of the nightshade family when ingested or get contact dermatitis from the plant leaves and pollen similar to the tomato plant. Studies have shown that eggplant can reduce high blood cholesterol and contains potent antioxidants and free radical scavengers that protect cell membranes and act as anti cancer agents. On a side note, skipping right along to the related potato. My mom always said 'do not eat or cook potatoes with green spots on them, it's bad for you'. I quietly brushed it off as an old wives' tale. Granted my mom was trained as a nurse in India and that might have had something to do with it, but I believe this holistic knowledge was passed on from generation to generation. While dismissive, the old wives' tale was burnt in my mind and I avoided buying potatoes with green spots to this date. Only while researching for this post did I come across a scientifically researched proof that green spots or sprouts on potatoes are an indication of elevated alkaloids in the potato. Cooking reduces the levels of alkaloids, but cut out any sprouted parts in potatoes before cooking, if not tossing them out altogether. My North African friend does not cook with green tomatoes which soon I will embark on a research on that. Curious thing, both potatoes and tomatoes are nightshades, so I wonder if there is a basis to my friend's old wives' tale?! This post was written for Father's Day but before I knew it I fell deep into the research abyss. Jonathan loves anything eggplant, brushed with olive oil and a sprinkle of salt, roasted to a glistening golden hue or grilled, with a crisscross pattern, to perfection. Charred and sliced into halfway lengthwise, with the flesh mixed with tahini, fresh garlic and lemon as baba ganoush, sometimes garnished with pomegranate arils when in season. Today I wanted to highlight an Indian preparation of eggplant similar to tampura. This is one of the ways my mom prepped eggplant, though I don't often cook it this way, I thought it would be a pleasant twist and surprise for Jonathan on this Father's Day. Speaking of dads, I am already tearing up as I am writing this, mine passed away in January 2007. I haven't been back to Israel since. My sweet almost 20 year old kid went on his first group trip to Israel with his buddies from UMASS. Even though he has traveled to Israel many times in the past with us, this trip has had a profound impact on him. I have barely spoken to him during his 10 days with the group, but once I caught him while they were at the Western Wall after a tour of Yad VaShem, the Holocaust Museum, he said he broke down. He fell apart at not being there when my dad passed away and fell apart for not yet visiting his grave site. Visiting the holy places and the Holocaust museum brought on all those overwhelming emotions. He is a good kid. Went with my mom, who is very frail, to the cemetery, while staying an extra week to visit with family, fetched water to wash the head stone and said Kaddish. Made my mom and am sure my dad as well, happy! Tip: Pick a firm eggplant with a smooth skin and a green stem as shown in the photo. The browner the stem is, the less farm fresh the eggplant is. I find the ones I buy lack the bitterness prevalent to eggplants and therefore I skip the steps of salting the eggplant slices, letting them sweat sitting at room temperature, rinsing and drying them to extract the bitterness out. If you wish a sweeter, creamier variety which I like as well. buy the Italian eggplants, they are similar to the one photographed, only smaller. Jonathan doesn't like that variety as much but I like them both. Oddly enough I am not a fan of the small globe like Indian variety, you find in Asian markets, being Indian myself. I usually like to work with a thinner batter by adding more water but the consistency below is easier to work with. You can add finely chopped cilantro to the batter or jalapeno you ran through a food processor or finely diced. You could even add 1/4-1/2 teaspoon of baking soda of you wish for a crispier, crunchier feel to the Indian fritter. As always, I recommend you leave your signature on it and make it your own! *Please note all information here is from research I've conducted, but I am not by any stretch an expert. Please consult a doctor about the benefits of eggplant as well as allergic and other adverse reactions. In a medium bowl add the batter ingredients and whisk with a small whisk into a smooth consistency. In a skillet or a frying pan heat up the oil on medium high. Cut stem and bottom off the eggplant and slice into 14 equal rounds, slightly less than 1/2 an inch each. Dip in batter and coat well. Let excess batter drip back into the batter bowl while holding the eggplant from one edge over the bowl and fry. Adjust heat to medium if necessary and fry until deep golden on both sides. Drain on paper towel lined plate. Cook's note: The oil will be enough and some for the entire batch. Keep the oil on medium high heat and adjust to medium if necessary. It is traditionally deep fried but I find this method works very well and produces identical results with less oil. I love how you always include a little history or back story with your recipes. I did not know the origins of eggplant. i also seriously thought that eggplant must have been middle eastern. There is a serious obsession with eggplant in my husband's family. Your recipe sounds divine and your photos and writing are so lovely. I am sorry for the pain that comes with missing a parent; I wish I didn't know it first hand. My daughter went on a Birthright trip to Israel and left a note for her grandfather in the wailing wall. I'm so sorry to hear about the fact that your miss your father... I haven't spoken to mine since 8 years (sad and painful too, but unfortunately better in this way). A wonderful recipe! So scrumptious looking and sounding. Sorry to hear Rosa. Maybe you will find peace and reconciliation in the future with your dad. Thank you for your kind words. Touching story. Kids are amazing like that! Hugs to you. I adore eggplant in almost any form under any name. I do prefer having a bit of a crunchiness to my pakoras so I add the baking soda you mentioned or even a bit of semolina flour. Love all parts of this post! Thanks for sharing. Oh yes! The recipe looks delicious as so your lovely pics! I've got goosebumps all over my body reading this post. Please hug that young man for us all. You've raised a fine man. 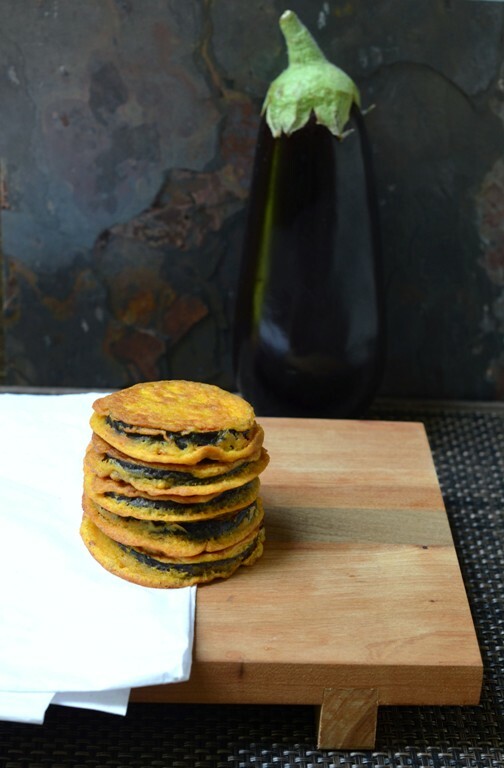 Eggplant is a favorite vegetable and this recipe looks great. What a perfect photo of the cakes. They look great! I also love anything eggplant and this looks fantastic. 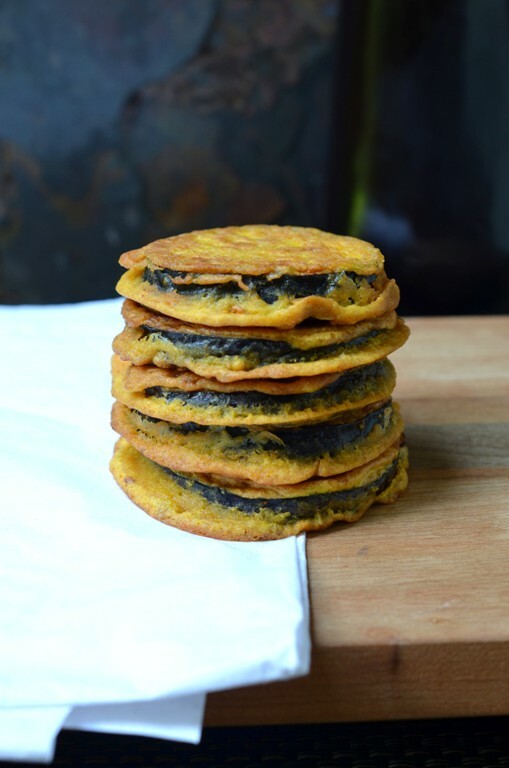 Did you know in Sicily (where they also love eggplant) there is a dish called panelle which is chickpea flour batter cooked and fried into a fritter? It's eaten either salted by itself or on a sandwich (street food). I loved these. With the leftover batter I made a couple pancakes, and put sliced (local/organic) strawberries and a little maple syrup on them: Delicious! These looks so good, your photos are gorgeous and I can't wait to get some eggplant! TY so much everyone. Wishing you all a Happy Father's Day weekend! Saw this on Twitter and had to check it out. I do lots of chickpea flour bahjiis and fritters. I use water like you but a chef friend said his Indian wife uses yoghurt instead. I like to use yoghurt for babaganoush as it's much lighter than tehina. As for the green potato thing your mum talked of, if eaten by pregnant mothers it can cause spinabifida in the child (or so my health visitor told me). Great blog! Wow thx for dropping by so educational/ I never use yogurt in the batter but I can see that being a good substitute. Baba Ganoush with Tahini sounds like a nice twist & interesting deet about the green potato. OMG zucchini flowers! So lucky! The story of your son honoring your dad touched my heart. 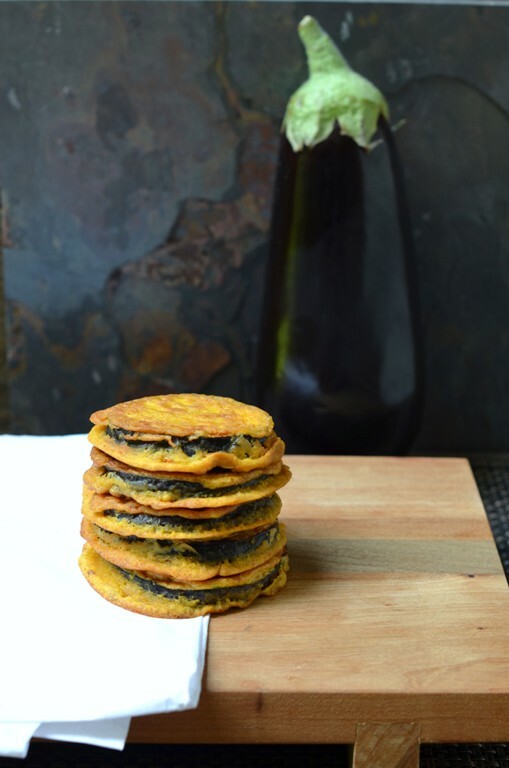 What a gorgeous stack of eggplant fritters! I never knew that they were classified as a berry...love that kind of trivia. We're growing white eggplant for the first time this year and I'm excited to harvest it. So touching, Shulie! I'm glad that he had a good time in Israel. I'm sure you're looking forward to going back. And these fritters? YUM! I'm all over these! It's a touching and beautiful story. You have a great son!! It does looks interesting. Rare for me to see such recipe.